The infirmary here is intended for human care. It is regularly scrubbed spotless and smells of disinfectant, redwort and other herbs that are - if sometimes strong - preferable to the scents of sickness. Cots are lined up against one wall, with a set of curtains that can be pulled to give some privacy to the occupants of the cots if they so desire. 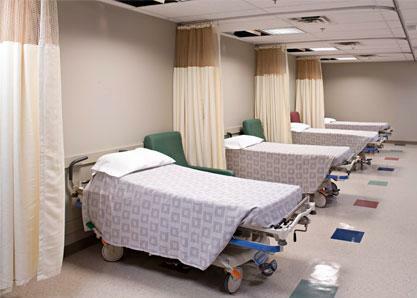 They're mostly used for examinations of patients and the treatment of mild injuries that won't require long term care; near the back are some more private areas with folding dividers. There's a number of cabinets that stand off against another wall, instruments and medications stored against when they will be needed, and a back room holds those supplies seldom required. A desk with chair is set just off of the doorway to the caverns, meant for the healer to sit and catch up on record keeping after a long day's work or await patients. If things get too busy, the patients can do the waiting on a set of uncomfortable chairs set nearby. The other doorway comes directly from the clearing, wide enough for a team to carry a stretcher through. Mother nature has decided to dish out low clouds rumbling with intermittent thundershowers. In the caverns of Xanadu Weyr, the kitchen crew are busy dishing a hot lunch to counter the sopping chill the cold front has brought this late spring day. It's wherry pot pie and it smells delicious, the scent wafting all the way- No, not really. That smell is courtesy of the lunch cart presently being trundled in by the headwoman. No vegetable soup and toast today for the inmates! But, see, that's because Darsce is killing 3 birds with one stone: she hasn't eaten lunch (and she's NOT doing the soup, kthx), she's feeding the on-duty healer-folk and their patients aaaaaaand she's due (probably overdue) for her last prenatal checkup. And likely late for the appointment also. Oh well, she has her reasons? But here she is! And by that we mean be afraid? Because she's smiling. Mur'dah ducks into the infirmary, running a hand through his damp, dark hair. Shaking the rain from his clothes he looks around for the Healer on duty, and instead sees Darsce. "Darsce!" he calls, grinning. "Hey, how're you? I've got news. Been trying to find you." Given the precipitation outdoors, anything taken there is likely to become soup whether or not it begins as such. Fortunately, there is an internal path from the kitchens to the infirmary. This fortune does not, however, extend to all parties. Jethaniel's schedule for today had him meeting a transport rider with supplies for the infirmary. This remained his schedule, but the transport rider was not actually on schedule; as such, while his waiting was conducted mostly over an overhang, he is rather wet at this point. The supplies have, however, arrived, and while they are being unloaded by that transport rider, Jethaniel (for purposes of efficiency) is carrying one such crate to the exterior entrance of the infirmary. He adjusts his burden in order to open the door, knocking with a tap of his foot as he does in case someone will arrange for this maneuver to be unnecessary. Kera just happens to be one of the on-duty types today, but just now returning with an armload of clean linens. Shuffling her feet a bit to make sure she doesn't kick a wastebin she 'knows' should be right about…there. Moving on as the side of her foot brushes past the obstacle, she breathes in appreciatively the aromas from the lunch cart. Gaze seeks out the source and she spots Darcse and Mur'dah. Stepping forward, she offers a polite nod and smiles to the both. "Afternoon Headwoman, Mur'dah." Tipping her chin towards the food cart, she focuses on Darsce "I'll put this lot away then come back and start with the trays." And on her feet are still moving as she skirts around the cart to restock the shelving cabinet. That done, she returns but doesn't get very far before a tapping draws her attention towards the outer entrance and the dripping Steward. Brfow arching at his appearance adn the crate by him, she detours to grab a couple of towels and offering them over "Afternoon sir." How is she? Darsce's mouth opens, but the blurted statement on the end forestalls her answer. Apparently the question put to her was merely a rhetorical one. She eyes her brother with a touch of dry suspicion, "We're you… trying to actually find me? Becaaaause looking for me in here is usually fail…" Seeing how often she misses appointments and the titter of laughter from a nearby healer illustrates her point. "Lemme guess," she drawls with faint sarcasm, a smirk pulling one corner of her mouth as eyeblue eyes flick to his belly and back to his face, "you're pregnant. With triplets. And Kiena's the one who done it." She resumes pushing the lunchcart the few remaining steps towards the desks first, noticing Kera and oh hey! She's got a stack of clean linens. "Hi, uh…" Squint. "Kera, right? Does this mean you won't need the afternoon linen delivery and I've got one less cart to push I hope?" The cart is where the healers may access it - that's all she's required to do. Aaand before she becomes a patient for that exam, she's going to eat. She's in the process of reaching for the tray she added for herself when Jethaniel is admitted. She calls casually across the room, "Jethaniel, how was your swim?" Then flutters him a wink. Mur'dah shakes his head, "No, I'm here to restock my first aid kit." He blinks at her, and then he grins and /laughs/. "No, but we are weyrmated now, so who knows what might happen." Turning, he smiles to Kera, and walks over to hold open the door for Jethaniel, if he still is a-tapping and a-rapping at the infirmary door. Kera's implied question is answered with, "It is raining." The statement may be somewhat obvious, in retrospect, but it is nevertheless the most immediately relevant answer. Jethaniel follows it with a, "Thank you," to Kera as he continues the admission process… which is, in his case, not a medical proceeding but merely a logistical ones as he brings that crate to set down on a table which appears otherwise unoccupied. "There will be others," he notes to Kera (as the most immediately obvious proxy of the healers). "They are… assorted herbs." A manifest was, surely, provided to the infirmary? Or so Jethaniel might presume, but he apparently does not recall the precise list at the present moment. His gaze lifts to observe Darsce, and he smiles to her before arching his brows at her suggestion. "It lacked coherency. The aquatic particles were notably diffuse." As he accepts a towel from Kera, he further notes, "Good afternoon." Jethaniel lifts the towel to wipe his face. He is certainly no longer tapping and/or rapping, but… maybe someone else is? Tapatap… oh, it's probably just someone being restless in an infirmary cot somewhere. Kera steps forward and swipes a few loose pages from the surface before the crate is set down. Then the mention of others has her looking back towards the door where more crates are indeed being brought in. Quickly pointing out where they can be set, she looks briefly flustered at the new task that sidelines her schedule, but shakes it off quickly. Rummaging around one of the desk drawers "Ah, yea.." Scanning the page a few seconds a nod dips her head gently "Someone's mind must have been drifting a bit, says delivery tomorrow. But no matter. Thank you for seeing to them in all that. We'll get them sorta out." She gestures towards the not so nice weather outside today. Trapping the pages in a clipboard, which gets tucked under her arm, she glances to Darsce with a little grin and confirming nod "One less thing on your list then. She cabinet was low when I cleaned a cot earlier soo." She gives a slight shrug as a couple other apprentices converge on the food cart and start getting the atients settled with their meals. Mur'dah's news is overheard, not that's she's easedropping, and a grin flashed towards the brownrider "Did the Weyrsecond like those Wherry-wiches? That's what the cafe called them." Darsce is pleased with Kera, "You're a doll!" She smirks over her tray at Mur'dah's answer and snorts, "Like… what? It wasn't possible before you moved in together?" And yet this is of note, the arrangement, and so she gives him her congrats Darsce-style, "It's about time." She breaks the crust of her pot pie, lifts a steaming forkful. "So," just before she takes a bite of her lunch, "when's the party?" Into her mouth goes her food as her gaze returns to Jethaniel. His answer sends her into a sputtering laugh, a puff of tiny pastry crumbs showering the yoke of her loose-fitting smock. She swallows without choking and suggests with a miniscule twitching of brows, "You want to see some incoherent swimming, come find me later." Smirk. Mur'dah peeks into the hallway to see if anyone else needs to be let in, and then he moves back into the infirmary. He grins at Kera. "She can't get enough of them. I think we've been back there three or four times already…" Looking back at his sister, the brownrider winks. "Possible I suppose, but now that we're living together…" He trails off with another grin, then laughs. Then blinks. "Party? What party?" Jethaniel's answer, as it always does, confuses Mur'dah so he just offers a small smile to his brother-in-law. "Ah, Jethaniel says to Kera's explanation. "They are, nevertheless, present." Today, even, and fortunately, there are those here to see that they're put into the appropriate places. He wipes his face and briefly tousle-dries his hair, then lowers the towel once more. There's a tapping at - no, the door's staying open to let people come in and out (and, incidentally, let small amounts of rain in), and so that tapping is… evidently transient, because it has just ceased. Jethaniel smiles to Darsce and inclines his head to her. "Potentially also localized," he answers, which is unlikely to further enlighten Mur'dah… to whom he also nods. "Congratulations," he offers in an observation of the usual forms of such interactions, and does not comment regarding the party. The crates are almost done being unloaded, and most of the people have gone out to get the final load while someone starts opening those here. Kera chuckles with a quick nod to Mur'dah "They 'are' very tasty. I took N'talya two. With the way she scarfed them down, she should be having twins." Meaning the sandwiches are very very good." As the food trays seems to be mostly handled by other apprentices, Kera turns her attention back to the clipboard. More crates are hustled in, trailing water in their wake but it'll be cleaned up shortly. Crouching down to the very bottom desk drawer a crowbar is grabbed for the crates. As she starts loosening a few of the lids, the word /party/ turns her head back Jethaniel and the others, sorta missing the point as she chimes in "Little Skyler's turnday party?" "With diving," Darsce adds smugly on the heels of Jethaniel's response, a secretive smile edging her lips, before she coughs and dips her head to busily prod at the crust with her fork. Ah there it goes, like the lid to a volcano (minus the explosion of molten…gravy), it's off allowing hot steam to find its way into the atmosphere. Back to her brother, she gapes. What party? Surely he can't… Kera speaks, sidetracking the headwoman momentarily. "Oh that. Cook's in a tizzy over it. Keeps asking me 'do they want flavor cake this or cupcake that?' I keep telling her to ask the Weyrleaders." Sigh. Her life is so hard! "Not that one, though. I meant yours, Squirt. Yours and Kiena's. Y'know, to celebrate your new-old relationship." Her poor brother gets another teasing grin. She is going to get smacked, isn't she? Mur'dah flashes Jethaniel a warm smile. "Thanks!" He laughs at Kera, nodding his head. "They are really quite delicious. Hope they stay on the menu forever. So when you have a moment or if you can direct me to someone who's free, I need a few replacement supplies for my first aid kit." His attention turns back to Darsce, nose wrinkling for a moment. "Mine and Kiena's? Why do we need a party?" Jethaniel inclines his head to Darsce. "Indeed," he answers her, then listens with some interest to Mur'dah and Kera's discussion of these sandwiches. They, in combination with the pot pie whose consumption Darsce is demonstrating, incline him to consider on the potential for his own consumption of food. This is sufficient to distract him for the moment; this is not of itself problematic, but… in other unfortunate news, the water dripped on the floor has not actually been cleaned yet, and so as some unlucky apprentices carries in one of those final crates… he slips. His feet start sliding out from under him, and with the weight of the crate he's off-balance and has difficulty compensating correctly. He fumbles for a place to put himself and that crate… and - technically - he succeeds. The crate is shoved onto the edge of a table; the apprentice catches himself on that edge and does not fall. What is less fortunate is that there was already a crate on that table, and it's pushed over the opposite edge where it wobbles and then tumbles to the floor, spewing its contents with a fluttering of herbs and a loud clatter of…. rocks? …evidently. Rounded stones, selected for their ability to retain heat, are strewn across the floor instead of being used to provide therapeutic warming. One of the largest, a silvery-grey ovoid, bounces off a padded chair and rolls away from the rest. A near-monochrome egg, lustrous silver and pale grey etched into its surface in patterns made of rhomboidal shapes of varying sizes. They imply a cross-hatched pattern, like an erratic sort of tweed, but they're not quite regular enough for that as they wrap around the outer surface of an egg that's not regular enough to be round. In fact, it might not quite be evenly ovoid, either… but given the way that patterning plays tricks on the eyes, it's difficult to be sure. Kera ahs softly and grins in sympathy with the numerous questions the cooks have bombarded the Headwoman with over the partyfood selections. A brief nod as she follows along the conversation while plucking out the invoice heet from the crate she opens fully. Pausing her scan she glances to Mur'dah "Sure, if you give me just a moment I'll take care of it myse…" She sudden skidding and frantic stomping catches her attention, looking past Jethaniel and things almost seem to slow down. Watching the chain of events as they unfold, Kera's too far away to stop any of it from happening and can only call out a quick "Look out!..Grab…" but too late, the crate crashes onto the floor, spilling it's contents in a chaotic fashion. Seeing things spill everywhere, her first concern is the one who slipped "Are you alright?" Looking him over briefly, she crouches a bit trying to see where a few things rolled. A couple of figures with apprentice healer knots hurry to try gathering the fallen supplies, and looking for what may have rolled out of sight. Darsce stares at her brother, then rolls her eyes. "W-e-r-m-a-t-i-n-g," she spells out with exaggerated slowness in an overly patient way before adding and stretching out the word, "paaaaaaaarty. To commemorate the occasion?" Brothers, so dense sometimes, gotta love 'em! She resumes eating because she's starved and makes inroads to her meal while the on-duty healers take theirs to the back room to have a quick lunch break. The apprentices are busy passing out those trays, so no one's going to rush her into an exam until after they eat, right? Or… maybe in the sudden chaos of crashing crate-to-floor, which brings them all tumbling back into the ward to see what the shell has happened will have them forgetting it entirely. Mutters of 'Turn your back for onnnnne moment and all hell breaks loose' and 'If it's not one thing it's another' before they filter back to their interrupted lunches. The headwoman glances at the scene of wreckage but the only finger she lifts is to manipulate her fork and mutter, "Cleanup on aisle four!" They've apprentices on it, so she's going to eat. Mur'dah jumps and tries to step forward to help when the crate crashes to the floor, bending to pick up a few of those stones. "A weyrmating party? Do people do that? I don't know if Kiena would want to do that…" he says even as he's helping the apprentices gather things. Jethaniel has… a towel. This is unlikely to be effective, and while he turns to see the chaos unfold (and unpack, very expeditiously), he is also not capable of taking action in a manner sufficiently expeditious to prevent it. The healer apprentice who caused the mess winces as he straightens up, nodding to Kera without taking his eyes off the mess. "Shards…" he mutters, then waves her off. "Yeah, I'm fine." But are the rest of the supplies? Hopefully there wasn't anything fragile in that box, and that rattling and tapping as things are picked up and set down is supposed to happen. The stones are still warm, some of them - maybe they were left waiting for a while out in the sun, the rider who brought them to Xanadu already running behind when he picked them up. Jethaniel regards the mess with a frown, but given that the apprentices are the ones more likely to know where these things actually belong, he takes a step back and lets them continue that process, clatters and groans included. "…we may require an improved loading dock." Kera and the other healer types works in groups of one or twos to gather the scattered contents of the crate. "It doesn't look like very much lost." only a couple of the herb containers seem to have been damaged and their contents scattered. The last fallen stone is found when someone windmills their arms suddenly, catch their balance then crouch down with a muttered curse. The floor is being swept where needed, one drymop toting apprentice moving around, wicking up the water. Kera stands again, nudging the crates a bit further from the edge of the table one by one. As the mess is being cleaned up, her gaze darts around and settle on the trio. Taking a second as if to figure out what she was doing before the little accident and recalling "Oh yea, give me your kit and I'll restock while you catch up." A grin flashed to the family as Darsce tells him just why he has to have a party. Looking to the Steward and Headwoman "Do either of you need anything the healer stores while I'm seeing to his medkit?" A quick gesture to Mur'dah's said medkit. Darsce has dinner…and a show? While she eats, she idly watches the cleanup, but it's more with the bored fascination one will exhibit when there's nothing else… ohwaaait. There's Jethaniel over there with a soaking wet shirt. She leers at him instead because he's busy and won't notice. Besides he's muttering to himself and though he's too far away for her to catch the words, she's seen that expression on his face before; he's already halfway into another project, isn't he? Her smile grows indulgently fond and her lips part to call him to her side when Mur'dah's question forestalls her. She blinks at him, then shrugs. "I…suppose they might do something special? Since they don't have wedding ceremonies. You don't think she'd like to celebrate?" What girl doesn't like to celebrate? Speaking of celebrating, "Have the two of you had any good dart games lately?" The question is not so out of the blue as it might appear says the smirk to follow. Kera speaks and Darsce, without missing a beat, drawls, "Something that'll birth my daughter (because she's 100% sure it's a girl, regardless of reality) without labor or pain?" They have magic back there in the stores, don't they? Mur'dah hands over his kit to Kera, with a smile. Then he shrugs at Darsce. "I…don't know. Maybe? She's kind of private. I guess I can ask?" Then he blinks in confusion. "Dart games?" Wait is that an inside joke he's forgotten? Probably. "So when /are/ you going to birth my niece anyway?" Were Jethaniel to have dressed for this occasion with Darsce's viewing pleasure in mind, the shirt would be more translucent. As it is… Jethaniel considers on Kera's question regarding the stores for a moment, then begins to shake his head. He pauses partway through that gesture as Darsce makes her own request, and his eyebrows arch. "…ideally, yes," he agrees, despite the dubious existence of such an article. His gaze settles on Darsce, distracted from the potential project that was previously distracting him. He applies the towel in his hands to his attire in a brief and mostly ineffectual attempt to blot out the moisture, then crosses the infirmary in order to place his used towel into one of the linen bins provided for that purpose. Its return to the laundry rooms to be cleaned once again will, unfortunately, be prompt. At least things here are also getting cleaned promptly, though… maybe that one stone wasn't quite the last. There's still a silver-etched grey ovoid that's rolled just about out of sight, half behind one of Darsce's legs… which, evidently, nobody has been looking at very closely in this particular moment. There's a scratching sound that might be the broom against the floor, a cracking one that might be a stone placed just a little too loudly against the table… only neither of those sounds quite came from their alleged sources, and neither does the relieved sigh that follows them as greyscale shell falls away from a wet little creature who just came in out of the rain. Wavy bands of red ochre and raw umber alternate along the body of this firelizard, a brindled coloration that breaks up her outline and helps - along with a rounded chest and sloped back - to give her a soft and unassuming shape that belies her size. Rust marks her in a few places, splotches of orange-red against the earth-tones of her body. There's some along the underside of her muzzle, made almost invisible by its placement, and uneven amounts speckled onto each of her paws and at the tip of her tail. Her wings, when spread, show sails of soft bole sprinkled through with spots of dark and light, hematite and pyrite. Kera hooks her arm around the kit Mur'dah hands over with a quiet nod, having no clue about the cryptic darty messege, and turns her gaze between Darsce and Jethaniel. Chuckling at the Headwoman's request, she pretends to give it a few seconds of thought. "There's been talk one of the Master's has been making remarkable strides, but last I heard, there was no /non-harmful/ such treatment ma'am." An appologetic yet goodnatured shrug is offered to the soon to be parents. "Perhaps a breakthrough will be com.." Trailing of, she cants her head a bit, peering around "Do anyone hear a weird scratching noise?…maybe something fell against the door from the bad weather." She tilts her head back and leans to see to see the main door better but the sound returns, and seem closer than the door. A sorta squelchy, crackly splaty sound draws her gaze to movement by the trio's feet, more importantly the Headwoman's. Gaze narrows trying to get a better look before her eyes go wide "How in the.. DON"T MOVE!!! your feet." She doesn't mean to order anyone, but didn't want anyone to accidently step wrong. She gestures to underneath Darsce frantically. "You're right, looks like a girl!" Feed that little one some Wherry pot pie quick! Jethaniel's shirt can be as opaque as it likes as long as it clings like that and Darsce's eyes follow his progress towards that hamper of their own accord. Sorry lil bro, but she's busy swooning, so the answer he gets is an absent, "Check out Kiena's dartboard sometime." He gets a glance followed by a smirk, "The whole thing, not just the bullseye." Innuendo? Not she! See this innocent face? Her head turns to Kera and she pouts. "No miracles back there? Damn!" A sigh with a resigned, "You're all fired." Like she can do that, riiiiight. Mur'dah's question garners a look of perplexity. "Uh." She didn't study for this quiz! "When she…reaches the expiration date?" As for scratching noises, she listens for a beat, then shrugs. "Maybe it's termites," she offers flippantly with an offhand shrug because there have been all sorts of noises in here what with crates crashing and stones rolling about. And no, she hasn't been watching those. Refer to sentence #1 for why. She's in the process of lifting another forkful to her mouth when Kera shouts. The headwoman freezes. Usually when someone yells DON'T MOVE it's the perfect time to run, actually. But Darsce isn't so great at that lately. She's not even great at getting up quickly. And so she looks down only, dimly hearing 'feed it' while she panics. Pot pie? They've all got pot pie. "Someone else feed it," she hisses, the fork halfway to her mouth forgotten. Mur'dah blinks. "OH. YES. Yes, that was /great/. I laughed." He remembers! The sight of the gold hatching has him laughing, shaking his head. "No way, not me…"
…it is likely desirable that Darsce and Jethaniel's child does not, in fact, expire on the occasion of expulsion from Darsce's body. "Ah…" Jethaniel begins, then trails off due to a lack of any more precise answer. He's partway across the infirmary when there is… another incident? Jethaniel frowns, attempting to assess the situation. His brows arch at Kera's assertion regarding gender, and he begins to return to the others to determine precisely what has everyone acting so… strange. Meanwhile, the hatchling murmurs something on a slow exhale, a sigh that turns inquisitive at the end. She turns her head, looking up at… is that a very large egg? It has the right curve to it! The new-hatched firelizard spreads her wet wings, fluttering them… which doesn't work as expected, but - with another flutter and a hop - she manages to lurch up and tangle herself in the hem of Darsce's smock, the fabric swaying back and forth from her impact as she creels something nearly as wobbly. Kera watches the little hatchling stretch out her wings with a cute little flutter, she looks expectantly between the woman eating for at least two, then Mur'dah when he seems reluctant to get close. Sensing another person coming up, she drags her feet on the floor not wanting to step on anything else that may still be rolling around, and moves out of Jeth's way. Turning back to the activity around Darsce's chair, she notices the little hatchling tangled up on the woman's skirt. Hushes whispers begin humming through the infirmary and soon every apprentice in the place has appeared to 'help' gather anymore loose stones that haven't been accounted for yet. In ten minutes, there won't be an inch of the infirmary that hasn't been looked at, at least three times by some eager young people hoping to find a little treasure of their own. Kera however is watching the family by the desk rather distractedly. "Obviously one of these crates were supposed to go elsewhere. Whatother explanation could there be?" The greenhealer muses mostly to herself, not expecting a reply to the mystery. In any case, someone better start stuffing that empty belly. Those apprentice's just there are edging a bit closer and a couple have food. Yes. That. Darsce would snicker at her brother only she's too busy freezing and willing herself to invisibility. Will it help if she shuts her eyes and thinks really hard that she's not here? The smock she's wearing is a long one. Seated as she is, the hem is easily accessible and the sudden weight on it has her eyes popping open and widening. Okay, now she's hyperventilating just a bit. What were you saying about that niece, Mur'dah? Stress can trigger labor, right? The clink-rattle of cutlery of other people eating resumes, over-loud in the room. Perhaps the sound might act as a lure… Can't you hear that little… orange… firelizard? As for those crates… What other explanation could there be? "Somebody hates me," mutters the headwoman in a vaguely, dark humored sort of way. Letter bomb firelizard, totally plausible, right? Mur'dah shifts his weight, backing up towards the door. "Kera? Got my kit ready?" He definitely doesn't want to impress the little gold. "Just impress her already, Darsce," he laughs. Jethaniel's frown is both perplexed and concerned as he - and, apparently, a number of the apprentices - approach Darsce's vicinity. "What is…" he begins, and then the sway of her skirt brings the tawny hide briefly into sight before it twirls around the young firelizard once more. He glances to Mur'dah at the brownrider's commentary, and his frown deepens as he strides toward Darsce. The question of this firelizard's derivation may prove difficult to determine - though later investigations will indicate that all the crates are (mostly) as they should be - but the disposition thereof is something that he seeks to adjust, kneeling down in front of Darsce and lifting her skirt (to a level still below that of certain other items in her wardrobe) and attempting to unwrap it from the firelizard, much as he might attempt to disentangle a buzzing insect from her hair. For that matter, Darsce's opinions of these two entities may be similar. Kera snaps out of her contemplation of just how the little hatchling arrived when Mur'dah questions his kit. Blinking at her friend a moment, she glances to the kit still clutched in her arm and gestures she'll be just a couple more minutes. With another quick glance to Darsce as Jethaniel begins trying to free the little hungry hatchling, then she's gone, vanished to the back hallways and out of sight for the moment while tending to restocking the med-kit. Moans of disappointment echo from the out of luck apprentices as no other little eggs are found, and they begin to scatter back to their duties. A couple of the crates are emptied and removed before Kera strides back back towards the desk again. "Here ya go Mur'dah." Mur'dah blinks in confusion at Jethaniel's frown, but that's par for the course for Mur'dah. But then he's frowning at Darsce's reaction. Is she afraid of firelizards? "Hey, relax, Darsce, if you don't want it think angry thoughts at it." Jethaniel intends - much as one might with that insect - to capture the firelizard and release it, either to an exterior environment where it may become a wild creature or into the eager hands of one of those apprentices who actually desires a firelizard. He is not intending to impress it himself - though he is intending to arrange matters such that that outcome (while, ideally, not occurring) is nevertheless more likely than Darsce's continue exposure. That is Jethaniel's intention. In actuality, the firelizard has rotated somewhat over the course of her struggles, and so when Jethaniel parts the fabric over what he believes is her tail… he is incorrect. The firelizard croons, excitement and joy as she wriggle-leaps up from the fabric (Jethaniel's hands provide a convenient launching point) and thumps against Darsce's hand. There's food! She gobbles it directly from the fork, curling her forepaws around Darsce's wrist to hug it warmly as she chirps happily in between bites. Oh, this is wonderful! So wonderful. So marvelous! She's so very happy as she gazes adoringly into Darsce's eyes, and despite her hunger there's only the faintest plaintive note to her chirp asking for more, because of course her special friend will provide! Kera sidles closer to Mur'dah, trying to nudge the rider to get his attention to the restocked medkit she's tryin to pass over. Peering back to the desk, her feet not moving forward any further. With several voices having said they don't want to impress the tiny little friend, a couple of apprentice's turn back hopefully, having acquired some tasty morsels to offer from somewhere. As they begin to inch forward, they hopes are dashed when Darsce's food is stolen right from the fork and the headwoman now has a new wrist cuff clinging daintily to her arm. Kera smiles around the trio and only now chances to ceep forward and get a better look at the hungry little queen. "Hmm. Shall I reschedule your prenatal appintment?" Yes, a bit cheeky perhaps, but what did you expect? Think angry thoughts? It's that easy? Darsce shoots Mur'dah another glance, this one sort of grateful, only now she has to come up with something other than the freaking out she's doing and with that in mind, she turns back to… Too late! The firelizard has leapt, wrist-clung and even worse, eaten off her fork. The headwoman squeaks and her reaction is purely knee-jerk. She shakes it off (it may well land in what's left of her now-cooled pot pie). Provision: accomplished. Though it was totally accidental so that doesn't count right? "Oh, no you didn't!" Impress, that is. She squints at it. Did….she? The lizard is lifted, tray and all and shoved at the nearest person. That'd be Jethaniel, hi! To whom she gasps, "Quick, uh… stick it underneath one of the crates or something." While she escapes. Cheeky, Kera? Of that appointment, "Yespleasethankyou!" Her answer tumbles out in haste while she's working to get her feet under herself and push herself up. Because she's not sticking around. She's going to flee. Like a tortoise. It's the best she can do. Mur'dah takes the kit from Kera. "Thanks," he murmurs. Watching the impression his head tilts curiously. Then he just grunts, checks his first aid kit, and leaves to go back to duty. Jethaniel winces as the firelizard leaps, the reaction a result - in some combination - of feeling sharp claws and noting that the hatchling has, despite his intentions, made for Darsce. He rocks back toward his heel, hands half-reached to… accept the tray of firelizard, evidently. He does so, arching a brow at Darsce with concern in his gaze before he lowers his gaze to… the tray, complete with hatchling. "…that… may not be entirely effective," he notes slowly, then lifts his gaze once more to Darsce as she begins to rise in preparation for an expeditious departure. As she does, another firelizard - this one, an adult green - appears from between and glides down to his shoulder, curling her tail elegantly around her paws and regarding the hatchling. Oh, joy! The young firelizard knew her trust was well placed, and now she knows it even more, because she's been flung (so efficient a mode of travel!) right into a fluffy-crusted bowl of delicious meat and juices. She purrs happily, nestling right in and eating. Such a good provider she has! Her big egg of love and affection, here for her just like her own little egg (now in silver-grey shards crunching underfoot) was before. Kera blinks, eyes going wide when the Headwoman shakes the little hatchling off. Thankfully, it works in the tiny queencuff's favor, who know has all the wherry potpie she can stuff herself with. Flicking her gaze between the couple, she sends a confused look to Mur'dah over the woman's actions, but he's heading off. Kera nods to Darsce's quick agreement of rescheduling, and seeing the woman is more than ready to leave. "Okie, I'll see to that and let you know when it's realloted for ma'am." And for good measure she adds "And congratulations on your friend." whether the woman wanted one or not. Flicking her fingers and a cheery dip of her head to the couple, "G'evening Sir…ma'am." she turns and heads off to off to speak with the Journeyman Darsce's appointment was with. Not…effective? Halfway to her feet, all that love and joy emanating from what used to be Darsce's lunch rolls the headwoman's way. She cringes, slowly sinks back to her seat while eyeing the creature quaffing down her pot pie. Mur'dah's departure goes unnoticed, Kera's gets an incoherent mumble. Iceblue eyes lift to Jethaniel's, her question a semi-whine, "Seriously? I can't just hide from her? Then dye my hair or…" shave her head? "something?" It's rhetorical, really. Wishful thinking, because right afterwards she reaches for the bowl, albeit reluctantly, and cupping it in her hands, she lifts it to eye level and says gruffly, "You're going to get sick eating all the grease in that crust." She adds a beat later, "Not that I care. I just… don't want to clean up after you upchuck." "It seems…" Jethaniel's lips twitch and his eyes lower. "…unlikely." He remains where he is, holding the bowl until Darsce reaches for it, then lowering his hands. He rises carefully, setting the tray - now absent of firelizard (and, indeed, lunch) down on the table and crossing to the linens cupboard in order to obtain the towel which he expects will be required. Along the way, he advises a few disappointed apprentices to go about their duties through the strategic use of glances and arched eyebrows. The firelizard puts her forepaws on the edge of the bowl, peeking up at Darsce and chirping sweetly. …she has a piece of carrot on her head. This does not dissuade her in the slightest from gazing adoringly at Darsce, her provider who would even go so far as to regurgitate food for her! …or something. She's not quiiite sure she followed that part of things. Towel nothing. That firelizard's going to need a bath! With plenty of soap and water, complete with lots of scrubbing! But the towel will be appreciated to dry it off afterwards? Whiiiich means Darsce is going to have to touch it, doesn't it? She flags down a passing apprentice and requests a basin of water and some soapsand. When it looks like the firelizard is slowing down on the horking of food, she reaches and snags it with thumb and forefinger to lift it by the tail from the bowl and eyes it sternly. "If you're following me home, you're not going there filthy." Aaaand that's because she's thinking of the floors, not her shoulders - or furniture - or, Farenth forbid, their bed! To Jethaniel, when he returns, she directs a somewhat befuddled look that flicks to Stardust (on his shoulder? oh maaan, they do that, don't they? But… they invented wings for a reason, right? ) and asks him, "How do you stand it?" One lacquered fingernail taps her own forehead, "It's all mushy-lovie at me. Gah. When does it stop?" Jethaniel raises his eyebrows slightly at Darsce's question, glancing from her to the golden firelizard and then back again. "I… do not know," he answers. "Stardust was not… mushy." Personality-wise, his firelizard may be considered to resemble a cat; often aloof, at times affectionate, seldom inclined to those not her own. Darsce's… is perhaps more akin to a golden retriever. Stardust spreads her wings (which have, indeed, been invented for a reason) and glides down to perch on the edge of that desk, observing the new hatchling with mild curiosity. It's with the auxiliary human; this makes it relevant to her life. The little hatchling chirrups as she's picked up, hanging limp from Darsce's fingers. Bathtime… is surely a fun adventure, and her trust in Darsce is total. She may have only just met this woman, but on the other talon, she's known her pretty much all her life! The world is a beautiful place, and she chirps at Stardust along the way. Hello, pretty green! You're going to be her friend too, right?